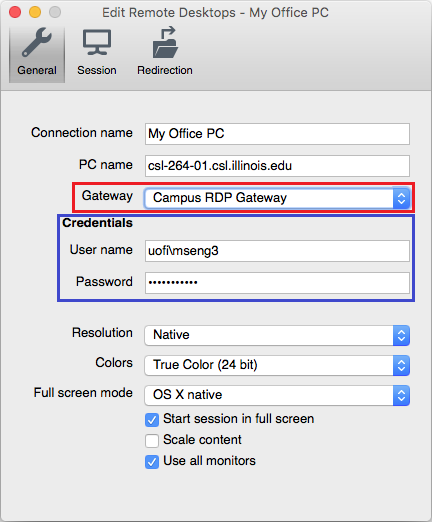 For security reasons, the University's Office of Privacy and Information Security (OPIS) has closed direct Remote Desktop access (port 3389) to campus from off-campus networks. 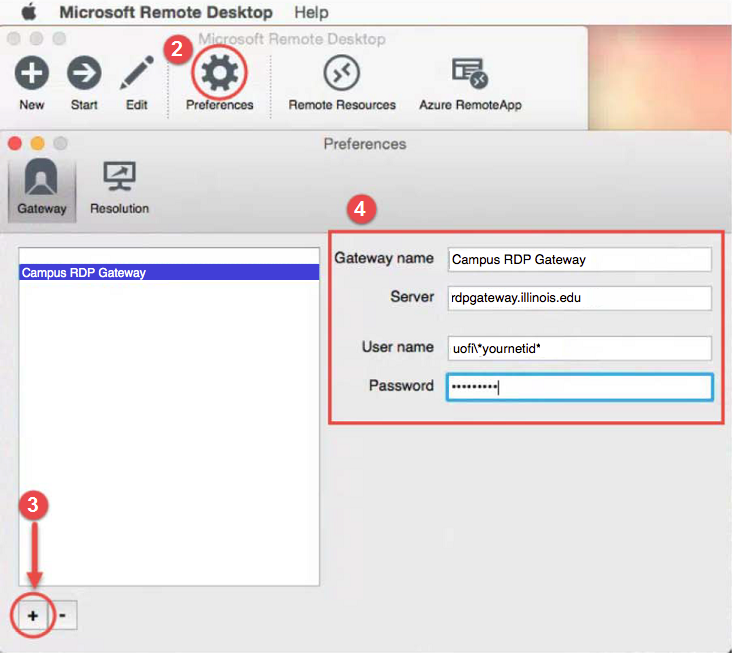 Your two options for connecting to an on-campus computer from off-campus, using Remote Desktop are 1) connect to the VPN first, or 2) configure Remote Desktop to connect to the campus RDP Gateway, instead of directly to your on-campus computer. 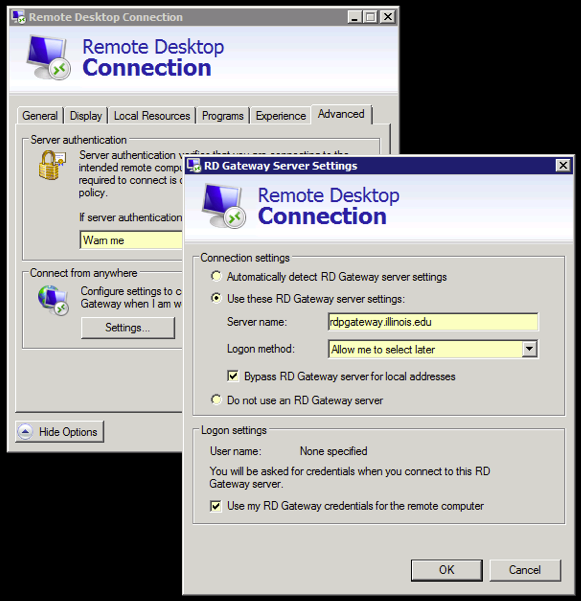 Below are instructions on how to configure Remote Desktop to use the RDP Gateway. Instructions for Windows and Mac are provided. 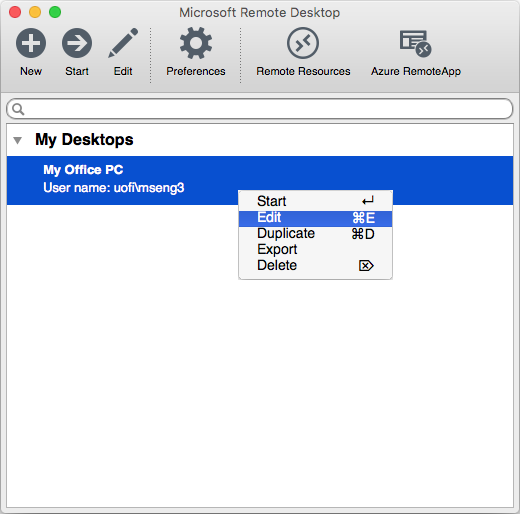 The steps will be similar for Remote Desktop apps on other operating systems (OS), such as Linux, Android and iOS, especially when using the official Microsoft Remote Desktop app for that OS. Note: These credentials are for the RDP Gateway server and must be your NetID. If you use a different account to log into the remote computer, you will enter that later. 5) Now add (or edit your existing) Desktop connections and configure them to use your newly configured gateway. Note: If you log into the remote computer with a local account (not your NetID), enter those local account credentials here (in the area outlined in blue).